St.Lucian roots reggae artist, Taj Weekes and his band Adowa, I initially met at my favorite bar, Red Square in Vermont while they were touring, in September 2008. Friends of mine who worked at the bar and others knowing that I was St.Lucian, alerted me that there was going to be a fellow St.Lucian, gracing the stage in The Alley. Of course, I went to show my support and introduced myself! Tonight Taj emails me about two of his recent videos. 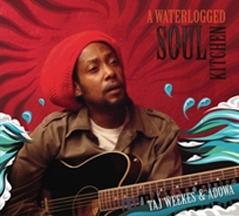 "Rain Rain" is the debut single from Taj Weekes and Adowa's latest and third album, "A Waterlogged Soul Kitchen." Filmed on location in St. Lucia at Fond Doux Estate.